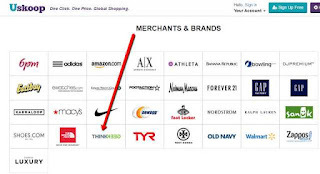 What if you can shop globally from more than 10 million products and choose from all your trusted merchants like Amazon, Macys, Zappos, Walmart and more---all in one place? Can I trust this merchant/site? Is this really all I have to pay? No surprise additional charges? Is it available in my country? Will they ship it here? If not, what if I don't have a US shipping address? Needless to say, I'm so grateful that Uskoop PH is now here. 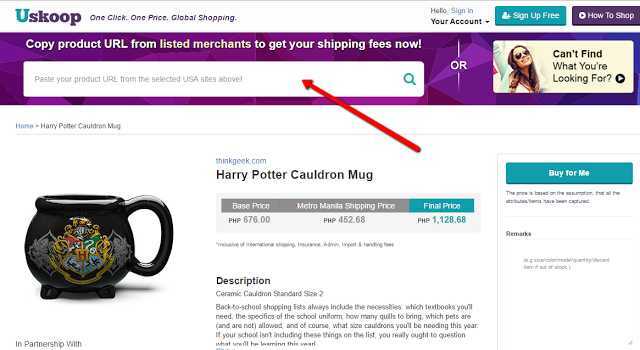 It's the answer to all my online shopping concerns. Most of all, Uskoop PH takes care of everything. The unique thing about Uskoop PH is that you only have to specify what you want to buy and Uskoop PH will take care of everything---from buying, to shipping to your address, to customer service, and post-sale support. Imagine my sigh of relief and squeal of excitement when I discovered this treasure of a site. 1. 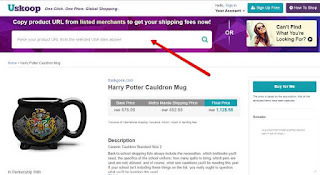 Head over to Uskoop PH and browse for the products you want from their top global merchants. I am a big Harry Potter fan so I chose to browse Think Geek for some cool HP merchandise first. 2. Copy the product URL link to Uskoop PH. 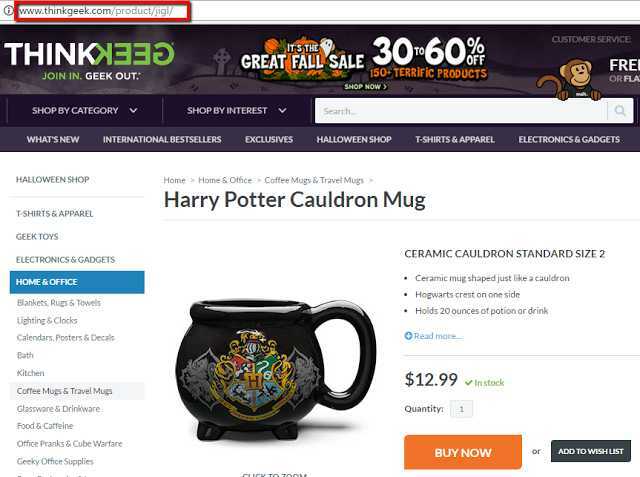 I chose this Harry Potter Cauldron Mug. It's so cute and perfect for my tea time! Yes, no more worrying if they will deliver the item to your local address or not. That's my favorite part of all. Tory Burch Minnie Travel Ballet Shoes. Because I'm a girl who loves ballet shoes and no ballet shoes is as elegant and gorgeous as Tory Burch ballet shoes. GoPro HERO4 Silver from Amazon. I love to travel and hate it when the trip isn't documented well. Photos may not give justice to the beauty of the Philippine sunset, but when taken with GoPro, at least it's still breathtaking. 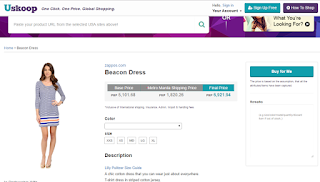 Lilly Pulitzer Beacon Dress from Zappos. It's simple, casual, but modest and classy. It's versatile and looks comfy. This dress I've found from Zappos is my kind of dress. How can a mature woman like me resist a fun-looking, cool and multicolored watch like this? Tee hee. Obviously, it's love at first sight. Plus, it seems to me that it will match the Lilly Pulitzer dress and Tory Burch ballet shoes above. And here's the best deal for this one. Betsey Johnsons strap watch here is only Php 4,970 with shipping (as seen above). At Macy's, this item + shipping + duties and taxes is Php 7,793. That's a whopping Php 2,823 savings for the same item! My, my. This frugal girl is in cloud 9. And since we're talking about Christmas list here, let me be your Santa. Use the promo code USKOOPTEN% to get a discount worth 10% off on shipping & handling. 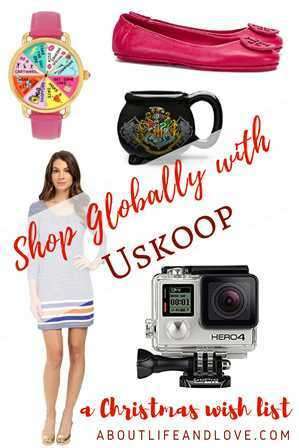 Happy global shopping with Uskoop! Follow Uskoop on Instagram and Facebook to get the latest update. Amazing products and service. I've never tried this but it sounds great. Who knew? I have to share this with Jenna as she REALLY shops a lot online!